Get in the Holiday spirit with vocal sensation Human Nature as they perform a brand new holiday show combining the best of both worlds: Christmas classics and Motown hits. "Christmas, Motown and more!” is an all-family production touring by popular demand as a lively, hit-driven holiday celebration. The show was a smash hit in its debut at the Venetian Las Vegas last season. Voted Las Vegas’ #1 vocal group and critically acclaimed worldwide, Human Nature performs Holiday classics from their new Christmas Album including White Christmas, Please Come Home for Christmas, Sleigh Ride, Silent Night – O Holy Night, Winter Wonderland along with a selection of the Motown greatest hits which Human Nature have become famous for. The show includes their 7 piece band and very special guest, singing sensation Ruby Lewis. This spectacular holiday production is the ultimate family-fun Christmas event for everyone of all ages. 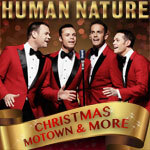 It’s beginning to look a lot like Christmas and Human Nature has a special show just for you!